I had an awesome time paddling on Sahoma! For such a small lake it really has a lot to offer. A very promising fishing spot with abundant wildlife and beautiful scenery. I enjoyed looking at the photos you took and exploring the area. I think a major reason for the pristine conditions on Sahoma may be due to the small size and the lack of heavy traffic on the water. 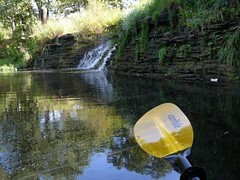 I'm looking forward to getting back on Sahoma and landing the "One that got away"
Thanks for a great kayak trip, Greg! I enjoyed Sahoma as well. Hopefully, you can catch a stringer full this weekend! Just for everyones information you can purchase the permits at the Walmart in Sapulpa or Sand Springs. The bait shop at Sahoma is open from 9-5 Weekdays & Saturday and 9-2 on Sunday. There is, however, not always someone there during these hours and Walmart is always open. 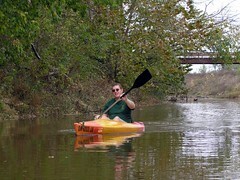 Also we have a forum specifically for Kayaking and Kayak fishing. This is a private website with no advertising whatsoever! Please drop by and visit! The last I heard swimming was not allowed.